Mouthwash acts as a defense that protects gum against disease. Mouthwash also prevents bad breath. I’ll like to note that mouthwash isn’t a replacement for brushing and flossing. However, it does more than you’ll get from those two. It cleans the whole mouth. When you rinse your whole mouth well, it kills bacteria in every corner of your mouth. I’ve tried a lot of mouthwashes over the past years, and I found ten to be great. Buy one of these mouthwashes, and you’ll have the best mouthwash for gum disease and gingivitis. TheraBreath is a company founded by Dr. Harold Katz. Dr. Harold is an internationally recognized expert in the fields of bad breath, taste disorders, tonsil stones and dry mouth. He’s known as the “Bad Breath” guru. 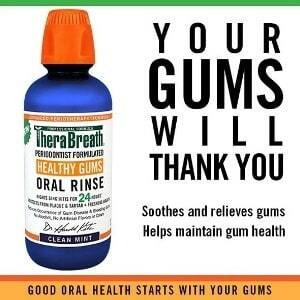 TheraBreath Healthy Gums Oral Rinse has been formulated to cure and prevent gingivitis, bleeding gums, and plaque buildup. This mouthwash contains CPC. CPC is an ingredient recognized by the US Food and Drug Administration (FDA) to be effective for treating gum disease or periodontitis. In case you don’t know, periodontitis is a serious infection that damages gums and destroys the jawbone. Dr. Katz’s patented formula that’s used in this mouthwash fights bacteria that cause bad breath. In each application, the oral rinse destroys all bacteria present in the mouth. The ingredients that are used to make TheraBreath Healthy Gums Oral Rinse are high-quality and safe for the body. The mouthwash contains zero alcohol, zero artificial flavors, and colors. The mouthwash doesn’t have saccharin in it. Saccharin is a popular ingredient in most drinks, cookies, toothpaste, and mouthwash manufacturers use to sweeten their products. I was very impressed with my experience with this mouthwash the time I tested it for this review. The oral rinse cure gum problems associated with pregnancy, menopause, and other medical conditions. TheraBreath Healthy Gums Oral Rinse has some certifications. It’s certified Gluten-free by Gluten Intolerance Group. It’s certified Vegan by American Vegetarian Group. It’s also certified Kosher by Kosher Supervision of America. This mouthwash is made in the USA. I like how it tastes. It doesn’t really have any flavor in it, and it tastes so well. TheraBreath improved the mouthwash in 2018 by adding CPC and xylitol. CPC is an FDA approved and clinically proven ingredient that kills germs in the mouth. And xylitol is a natural sweetener with proven oral health benefits. Despite making a good improvement to the oral rinse, TheraBreath is facing some backlash from its old customers. Old customers were too used to the old formula that they couldn’t take the new formula. It would have been nice if they had created a different mouthwash with a different name. Like most mouthwash users, I don’t like a manufacturer suddenly changing the old formula I’m already too used to. 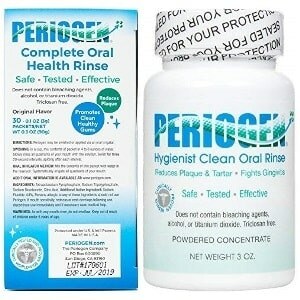 Periogen Oral Rinse safely and progressively ends bleeding gums. I like that it works slowly. I don’t recommend products that work aggressively. It’s a sign that they contain harsh chemicals that may eventually do more harm than good to the body. The mouthwash reduces tartar buildup with its unique, patented formula. With a mouthwash like Periogen, you can feel relaxed about tartar. Your whole mouth will feel refreshed after you use it. Periogen Oral Rinse won the prestigious 2018 Edison Award under the Injury and Disease Prevention category. Periogen is powder. The mouthwash can be swished in the mouth or applied via an oral irrigator. A study by the Periogen company itself finds that its mouthwash can reduce plaque and tartar buildup by 45% when compared to brushing alone. That’s impressive. Periogen doesn’t contain ingredients like alcohol and triclosan. Alcohol and triclosan can erode tooth enamel. Periogen is the best for tartar reduction. People with heavy tartar accumulation reported that the mouthwash helped them reduce it. Buying Periogen means you have the best mouthwash for gingivitis because heavy tartar makes it easy to develop gum disease. I added ½ spoonful Periogen powder in ½ cup warm water and let it dissolve. Then I swish it in my mouth for 1 minute and spit it out. You can also use a toothbrush to brush with it if you want. Note that it should be after you’ve used toothpaste for main teeth brushing. One customer reported using Periogen to remove tartar within two months of daily usage. The mouthwash does what it promises. You won’t be disappointed buying Periogen. Periogen Oral Rinse isn’t for everyone because it’s powder. Some people are so used to using a liquid mouthwash that they find it difficult to try Periogen. I’ll like to see a liquid version of this mouthwash. Tooth and Gums Tonic is a highly effective mouthwash that cures and prevents bleeding and inflamed gums. The mouthwash also eliminates bad breath. 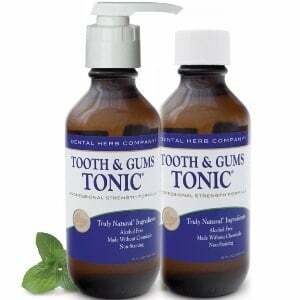 For Tooth and Gums Tonic to be effective, you’ll have to use it daily for, at least, two weeks. This mouthwash is made with natural ingredients. It doesn’t contain alcohol and won’t stain your teeth either. The brown color the mouthwash has makes it seem like it stains the teeth. It didn’t stain my teeth at all. And the manufacturer also back that up by stating that its mouthwash doesn’t stain. It’s recommended that you don’t dilute the mouthwash with water. And the manufacturer also advises not to use water to rinse after swishing and spitting out the mouthwash. You wash the good stuff off your teeth when you do that. Tooth and Gums Tonic contains zero animal products and has not been tested on animals. The mouthwash is manufactured in the United States, and it’s very safe for the body. I found that this mouthwash is probably the best for people with receding gums. Your gums will feel healthy and less vulnerable once you start using the mouthwash. Some customers bought it because their dentists recommended the oral rinse to them and they love the results they got from using it. Tooth and Gums Tonic mouthwash doesn’t disappoint at all. The taste is fine. Not sweet or sharp. I’ll say that the taste is normal. You should start noticing big positive changes in your teeth and gums within 1 – 2 months of using the oral rinse. The result you’ll get from using this mouth rinse will surprise your dentist. This is a perfect oral rinse for people who want something that works and produced with natural ingredients. Tooth and Gums Tonic oral rinse freshens the breath without giving you a dry mouth. It destroys the bacteria in your mouth in each rinse. The mouth rinse is no doubt the best mouthwash for gum disease. I have no doubt that you’ll like it. This mouthwash is a little bit expensive. The price can turn some people away from buying it. But if you buy it, you’ll be buying a high-quality oral rinse made with high-quality ingredients. Still, I’ll like to see the price down a bit. OraMD Original Oral Rinse has been clinically proven to cure and prevent periodontal disease. This is a high-quality mouthwash that supports healthy teeth and gums. After brushing and flossing your teeth, there are probably some parts of your teeth you didn’t brush and floss well. With an oral rinse like OraMD, you can penetrate those areas and kill bacteria that live there. Your teeth, gums, and mouth will feel fresher and cleaner immediately you use OraMD Original Oral Rinse. You’ll get immediate relief from any sensitivity in your mouth. OraMD is super effective. It felt so nice in my mouth after using it. But as with all mouth rinses, you should use it after brushing and flossing your teeth. It’s hard for any mouthwash to be effective when you replace it with brushing. Very few mouthwashes can beat the quality of the taste of OraMD Original Oral Rinse. The mouthwash is made with some of the finest and freshest ingredients. The ingredients are pure spearmint leaf and peppermint leaf oils and sweet almond kernel oil. The oils are free of insecticides, herbicides, and fungicides. OraMD comes with both a toothpaste and an oral rinse. I decided to focus more on the mouthwash because that’s what we care about in this review. The toothpaste works fine too if you don’t mind trying it out. I didn’t really use the toothpaste during my review of the product. I chose to focus more on the oral rinse because that’s what I’m writing about. I was very impressed with the performance of this mouthwash in my mouth. It made my whole mouth feel so clean during the time I used it for the purpose of this review. And applying the mouthwash is simple: Put 1 – 2 drops of the mouthwash in an ounce of water and gargle. One bottle of the rinse can last you for a month. The mouthwash doesn’t stain the teeth at all. OraMD is made in the USA. Customers highly rate OraMD on Amazon, which is a good sign of customers’ satisfaction. 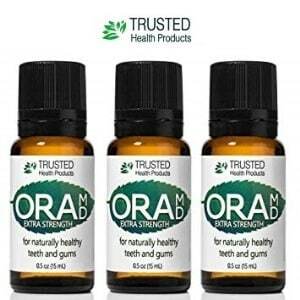 Despite being made with essential oils, OraMD could make your mouth burn if it’s a little bit sensitive. The product is very effective for gum disease, but I’ll like to see it burn less for people with sensitive teeth and gums. CloSYS Original Unflavored Mouthwash is the perfect choice for people with sensitive mouths. It doesn’t contain alcohol or any other ingredient that burns the mouth. Customers with sensitivity I reached out to all said that it works gently and effectively for them. CloSYS kills 99% of germs in the mouth when you use it. It makes the mouth fresher and cleaner. It’s the best mouthwash for bleeding gums. CloSYS is alcohol-free, sulfate-free and gluten-free. The mouthwash is ADA accepted. That’s great for a mouthwash made in the United States. According to the manufacturer, CloSYS is powerful enough to kill bacteria within 10 seconds of swishing it in the mouth. Bacteria are what breed gum disease. CloSYS works best when you use it immediately after brushing. You should gargle at the back of the throat so that it can reach areas your toothbrush can’t. The manufacturer advised that you avoid eating and drinking 30 minutes after using the mouthwash. CloSYS is safe to use multiple times a day if there’s a need for that. For example, if you’re struggling with serious gum disease, you may want to use it multiple times a day. Consistent daily usage of CloSYS prevents and treats gum disease. CloSYS Oral Rinse is highly recommended by dentists. I’m a big fan of the CloSYS brand. All of their oral care products work effectively. CloSYS Oral Rinse works all day long for people with bad breath. You don’t need to rinse with water after using CloSYS mouthwash. Doing that reduces its effectiveness. As long as you keep the mouthwash for 30 seconds as recommended by the manufacturer, there won’t be any bacteria left in your mouth. CloSYS is better than most oral rinses available in the market today. Their multi-patented formula works. Most other manufacturers don’t have patents, and their formulas aren’t that effective for gum disease. 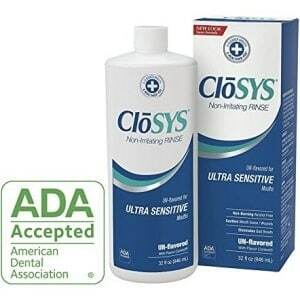 CloSYS Oral Rinse is highly rated by consumers. It currently enjoys an average 4.6 stars out of 5. I like the mouthwash. But that’s not to say it’s perfect. The mouthwash is too minty. It’s not the ideal mouthwash for people with mint allergy. That’s a long name for this oral rinse. I’ll simply call it The Natural Dentist Healthy Gums Rinse. You’ll notice that I removed the word “antigingivitis” from its name. I believe that word was added to the name because it’s what this oral rinse does. It protects and prevents gum disease. The oral rinse is all natural. And it works. The Natural Dentist Healthy Gums Rinse is made with a unique blend of herbal extracts formulated by a dentist for his patients. This mouthwash isn’t an ordinary rinse. I’m a big fan of natural ingredients. That’s not to say that I don’t like oral rinses that are chemically-formulated. As long as they are effective and are safe to use, I like them. But I like natural ingredients more. This oral rinse is 20% Aloe Vera according to the manufacturer. I like mouthwashes that contain Aloe Vera in them because it’s a powerful ingredient that does a lot of good things for the teeth and gum. This oral rinse is highly effective for people who have late-stage gum disease. It works very quickly. That makes it one of my favorites and the best mouthwash for gum disease and gingivitis. The rinse is also effective for bad breath. As you may already know by now, I also care a lot about where a mouthwash is made. 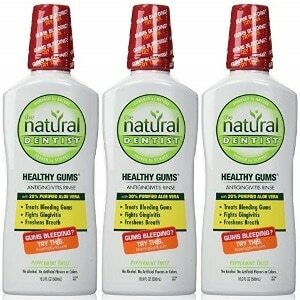 The Natural Dentist Healthy Gums Rinse is made in New Jersey, USA. For me, that’s cool. I asked some people with sensitive teeth to try the rinse. When I got back to them, they all told me that it doesn’t irritate the sensitivity. And they feel like the sensitivity in their teeth and gums have been reducing after they started using the mouthwash. A lot of people agree that this oral rinse works. It enjoys high-ratings across multiple consumer platforms I checked. It enjoys an average rating of 4.5 out of possible 5. I have no problem with the oral rinse itself, which I think it’s the best mouthwash for bleeding gums. The cap was very difficult to open. It’ll be nice to see the manufacturer make the cap easier to open. Primal Life Organics Gum Serum is a high-quality, all-natural gum detoxifier. It’s not really a mouthwash, but it works much like mouthwash for the gum, and it’s very effective. Why did I decide to add Primal Life Organics Gum Serum here? It does everything you’ll expect from a real mouthwash, and it’s made with natural ingredients. 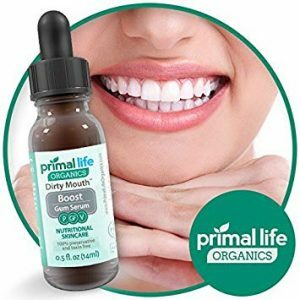 Primal Life Organics Gum Serum cleans your gum tissue and fights bad breath. It also keeps the teeth healthy. This product contains eleven essential oils. The mouthwash is formulated with a unique blend that’s patented by the brand. Primal Life Organics Gum Serum removes all toxins and maintains a healthy balance in your mouth. The product is gluten and vegan-free. Apply 1 – 2 drops on your finger and rub it on your gum tissue. Apply 1 – 2 drops on your toothbrush when you add toothpaste. Add 2 – 4 drops to a small amount of water and swish. The product is manufactured in the United States, and it’s made with natural and healthy ingredients. You have nothing to worry about regarding your body safety. Primal Life Organics Gum Serum is highly rated by consumers as it enjoys an average star rating of 4.5 out of 5. It’s a product I recommend. I like it because it’s unique, made from natural ingredients, and above all, it’s effective. There’s no point in using a mouthwash or detoxifier if it doesn’t work. I had a few doubts before buying the product. But after using it and seeing the amazing effect it had on my teeth and gum, I can tell you that this is the best mouthwash for gingivitis. I like the nice and cool taste of the product. It tastes so nice that you may want to apply more drops on the gum. Some people with sensitive teeth and gums reported that the pain went away within a few weeks of using Primal Life Organics Gum Serum. The product is a little bit expensive when you compare the quantity to the price. It’ll be nice if the manufacturer could increase the quantity of the liquid that comes in the bottle. I really love this product, but I think it’s expensive, which could turn some people away. 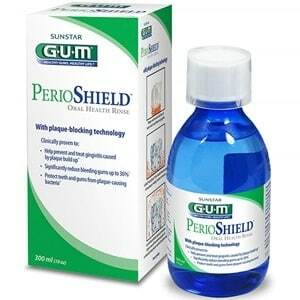 According to the manufacturer, PerioShield Oral Health Rinse alone can reduce bleeding gums by 36%. The oral rinse can also totally prevent you from having bleeding gums and gum disease. The rinse kills gums and plaque-causing bacteria within 30 seconds in the mouth. PerioShield is very effective. The mouthwash has been clinically proven to treat gingivitis. It also effectively reduces plaque buildup. The mouthwash is manufactured in Italy. Why am I recommending PerioShield Oral Health Rinse in this review? Because it works very fast. It gives you fast relief to your pains. It’s one of the fastest according to people with sensitive teeth and gums. It doesn’t feel nice to be in pains. Pains from the teeth leave you unable to do nothing. And that can be extremely costly if you have a lot of work to do. PerioShield beats many other oral rinses out there because it works extremely fast. I guess that the alcohol used to make the mouthwash in addition to its unique blend make the product one of the best mouthwashes out there today. According to a customer I contacted, she said there was less bleeding as she continues to use it over a week. The pain and bleeding were almost not existent after seven days. That’s amazing for anyone who has been battling sensitive teeth and gums for years. Although most of the mouthwashes on this page are very effective in treating and preventing gum disease, few works as fast as PerioShield Oral Rinse. The mouthwash cleans the teeth. It makes it whiter and attractive. Your teeth will become noticeably different when you use the mouthwash. I’m not a big fan of alcohol. I generally don’t recommend products that contain alcohol in them, but this mouthwash is just too amazing not to include it here. It works fast. People who’ve used it didn’t mind the alcohol. They told me that they just wanted something that works very fast. Nevertheless, I still don’t like alcohol. Listerine is one of the most popular and trusted mouthwash brands in the world. 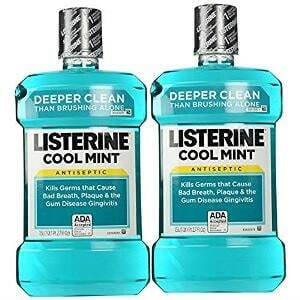 Cool Mint is the most popular mouthwash from the Listerine brand. You’ll find it everywhere online and offline. The mouthwash is very effective. It’s one of the best mouthwashes today, but I don’t consider it more effective and high-quality than the first eight mouthwash brands above. That’s not to say it’s not good. It is very good but not as good as those above. Listerine kills 99% of bacteria that cause bad breath, plaque, and gingivitis. So, you can use the mouthwash to prevent and cure gum disease. Your mouth feels cleaner and fresher after using Listerine Cool Mint. It’s been clinically proven that it reduces plaque 52% faster than brushing and flossing alone. Like most oral rinses, Listerine reaches 100% of your mouth. Brushing and flossing can’t reach everywhere. In fact, brushing only reaches 25% of your mouth. Bacteria are everywhere in your mouth. Only a great mouthwash like Listerine can get to all these places. Listerine Cool Mint has a nice taste. I guess it’s the reason why most people like it. For people who just started to use mouthwash, they may want to buy one with a nice taste to keep them using it every day. It’s hard to convince anyone to use a mouthwash that doesn’t taste nice. Listerine Cool Mint isn’t alcohol-free which is the reason why I’m not a fan of the mouthwash. In fact, 20% of the mouthwash is alcohol. People with sensitive mouths often complain about the product. I’ll say that Listerine is great for people who don’t have sensitive teeth and gums. If your teeth or gum aren’t sensitive, you’ll be able to prevent disease with it. But if your gum and teeth are sensitive, you’ll feel pain after using the mouthwash. Listerine is very good at healing wounds. Alcohol! I don’t like alcohol. Perhaps as a result of too much alcohol in the mouthwash, it burns a lot for people with sensitive teeth and gums. Listerine is one of the cheapest in this review. I’ll like to see the quality of the mouthwash improved. Many people use Listerine today. But that doesn’t mean it’s made with the finest ingredients. I’ll love to see something better. The name of this mouthwash was weird to me the first time I saw it. I’ve never seen or heard the word “miracle” being used to describe a product like a mouthwash before. If the name sounded weird to me, why then is it included in my list of the best mouthwashes? I included it here because the mouthwash is better than most brands out there. It’s effective in curing and preventing gum disease. Uncle’s Harry Miracle Mouthwash is made with pure, natural ingredients of the highest quality. The product is safe and non-toxic. It’s made with essential oils of peppermint, eucalyptus, clove, wintergreen, and oregano. The mouthwash is completely free of fluoride, carrageenan, triclosan, artificial sweeteners, and SLS. It’s made in the USA. Shake the mouthwash before using it. Swish for more than a minute to get the best result from the rinse. Miracle Mouthwash can be diluted with water if you want to do that. Uncle Harry’s Miracle Mouthwash is a fantastic product. It works amazingly well. And it’s made with natural ingredients. If you like rinses that are formulated with natural ingredients, this mouthwash should be at the top of your list. This mouthwash can reverse damages done to your gums. You can use it twice daily for maximum effectiveness if your gum disease is in the late-stage. Oral rinses that contain zero chemicals and sweeteners are my favorites. Miracle Mouthwash is one of them. Listerine may be more popular, but I’ll rate this mouthwash above Listerine. 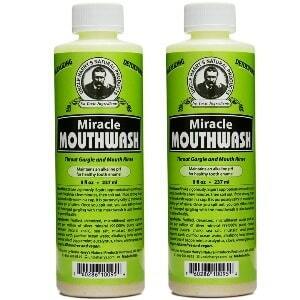 You won’t be disappointed trying Miracle Mouthwash. It’s an oral rinse that’s gentle on sensitive gum and slowly reverses the damage done to it by bacteria. I was a bit skeptical of the mouthwash at first. I went on to buy it and never regretted the decision. The mouthwash exceeded my expectation on every level. In fact, its performance made me say “Wow,” because the result from the mouthwash was so surprising. The taste of the mouthwash is very strong. It could leave your mouth feeling so bitter some minutes after using it. I’ll like to see a better taste. If the manufacturer can improve the taste, that will make many more people like it. There are some factors you should consider before buying a mouthwash. Knowing these factors will help you make the right buying decision. So, what are the factors I’m talking about? 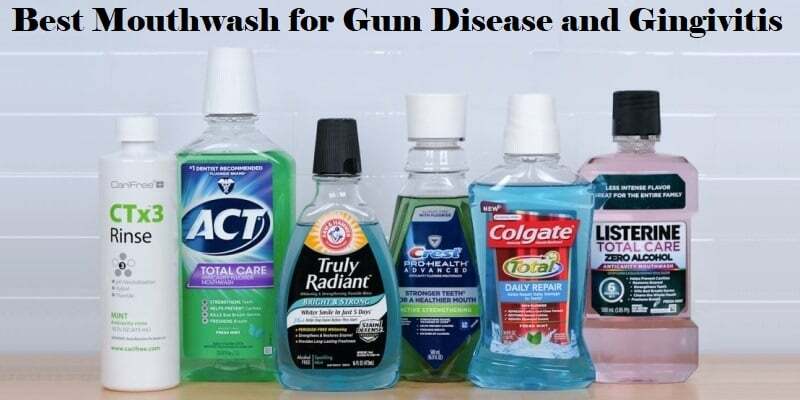 A good mouthwash must be able to prevent and cure gum disease. If a mouthwash can’t do that, then you shouldn’t buy it. As long as you brush and floss your teeth well, your chosen mouthwash should do a good job of preventing gum disease. Over the past years of using various mouthwashes, I’ve never felt any sensitivity in my gums and tooth. That’s because I use good products that work. All the above oral rinses will help you cure and prevent gum disease. They are effective, and you can fully trust them to deliver. A good mouthwash shouldn’t just be effective. It should also be made with ingredients that are considered safe for the body. If the ingredients aren’t safe for the body, then that’s not the mouthwash you should be using at all. Fine ingredients mean that the formula used to make the mouthwash is unique and patented by the brand. The ingredients used are also accepted by the FDA. I hate alcohol. Too much of it is bad for the mouth. Alcohol makes mouthwash effective, but it’s also not too good for the mouth. Manufacturers who don’t use alcohol always specify it on their label. They write the phrase “alcohol-free.” Consumers pay attention to this. A mouthwash that uses alcohol doesn’t really mean that it’s bad. It only means that it’s not good enough. If your feel pain in your teeth, gum or mouth after using a mouthwash, it means the oral rinse is harsh on your mouth. I try to stay away from harsh products. Yes, they may work, but I don’t accept that a mouthwash should leave you feeling discomfort after using it. There are better mouthwashes that are great for sensitive teeth and gums. I listed some great ones above. So, you don’t have to worry about sensitivity when buying a mouthwash. Some oral rinses are hard to use. A mouthwash that isn’t easy to use means that you won’t be washing your mouth with it most days. I like a mouthwash that’s easy to use. I don’t have to do too many things to use it. A great mouthwash should be easy and simple to apply. Most of the above mouthwashes are easy to apply except for Periogen Oral Rinse where you need warm water to apply it. A great mouthwash should keep your breath fresh and cool. It should keep bad breath away from your mouth. I don’t see a point of using a mouthwash if your breath still stinks. All the mouthwash I recommended above are superb for dealing with bad breath. They make your breath cool and nice. You don’t want to miss that. A great mouthwash should destroy most of the bacteria in your mouth prior to its use. Yes, I know that brushing with toothpaste kills bacteria in the mouth. But most of these bacteria are still there after brushing because the toothbrush can’t reach all parts of the mouth. The nice thing about using a mouthwash is that it gets to every part of your mouth. The mouthwash should be able to destroy all the bacteria because it has the ability to get to places where a toothbrush can’t. If you want to buy a mouthwash that kills bacteria, prevents gum disease and freshen your breath, you have it. Buy one of the above mouthwashes, and you’ll have the best mouthwash for gum disease and gingivitis. You’ll never have swollen and bleeding gums again because the mouthwash will take care of it. You shouldn’t wait to have a gum disease before you start using any one of these amazing mouthwashes. What is the Best Toothpaste for Bad Breath?